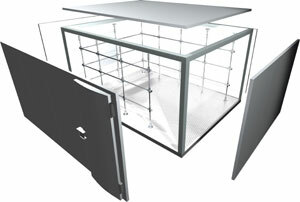 Game Larders and Cold Rooms built to meet your needs and comply with the new Food Standards Agency (FSA) Game Meat Regulations*. We have a wide range of game larders from our bespoke range that can be built literally to any size that you require. Alternatively if you are a small shoot or occasional stalker then our self assemble range could well be the right option of you. We have added to our range specific accessories that make our game larders ideal for other uses such as wine racks for wine chillers and a wide range of shelving for produce storing. We have also installed a number of commercial larders and chillers. If you have a large commercial project that requires cold rooms or extensive refrigeration please contact us. As of 1st January 2006 it became a legal requirement for shot deer to be stored at 7°C or below and for shot ‘small game’ (i.e. game birds) to be stored at 4°C or below. If you are selling game to a game dealer or supplying other customers with game you need a game larder or cold room. Once your game larder is installed you will need to register with your local authority as a food business under the new legislation. There are a wide number of uses for our game larders and cold rooms including using our cold rooms as a wine cellar. We welcome your enquiry whatever the nature whether it is for our self assemble cold rooms to one of our bespoke game larders.